Explanation: While orbiting the planet during their June 1998 mission, the crew of the Space Shuttle Discovery photographed this view of two moons of Earth. 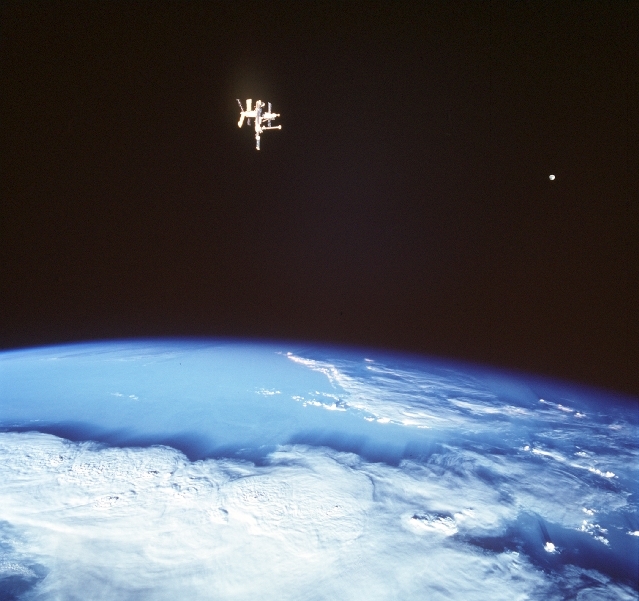 Thick storm clouds are visible in the lovely blue planet's nurturing atmosphere and, what was then Earth's largest artificial moon, the spindly Russian Mir Space Station can be seen above the planet's limb. The bright spot to the right of Mir is Earth's very large natural satellite, The Moon. The Mir orbited planet Earth once every 90 minutes about 200 miles above the planet's surface or about 4,000 miles from Earth's center. The Moon orbits once every 28 days at a distance of about 250,000 miles from the center of the Earth.